The story of Keilor St Bernard’s Athletic Club. Ron Stobaus started the original St. Bernard's Old Collegians Athletic Club in 1965 for St Bernard’s students. It merged with Keilor Heights Women’s Athletic Club in the 1980s and is now a force in Victorian athletics in the northwest region. 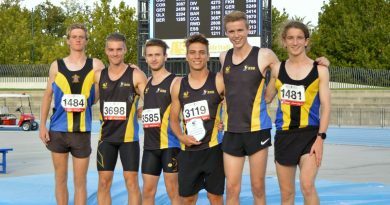 Over the decades Keilor St Bernard’s has regularly won premierships in both track and field and cross-country divisions and our athletes frequently go to State and National championships. We have had State and National champions, Commonwealth Games competitors, and two world records. But most of all, we have a loyal membership base who enjoy training with their friends and whose favourite race is the next one. The history, The First Half Century – Keilor St Bernard’s Athletic Club 1965-2015, was launched at an event on 28 August 2016 attended by some of our earliest members, family and friends as well as current members and friends of the Club. Published by Clarity in Design, the book provides a fascinating timeline of the Club’s history, with anecdotes and photographs provided by many of our past and present members. It is an essential look into how a local sports club was envisioned, came into fruition and was built up to become a force in Victorian athletics. $19.95. Review by a reader and one-time member of Keilor St Bernard’s Athletic Club.